They arrive at the Missouri Botanical Garden in an almost constant stream, in boxes adorned with shipping stickers from all over the world. They are plant specimens, collected in the field, and they are the raw material, the building blocks, of botanical knowledge. Pressed between sheets of paper and accompanied by field notes, they await identification, cataloging, classification and analysis. 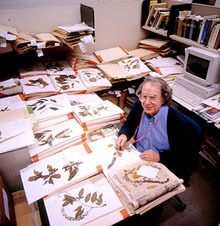 Amid these stacks of specimens is where the bulk of the botanists' research takes place. The exacting science of systematics - also known as taxonomy - is their primary activity. The MBG is known for its expertise in this highly specialized and valued field. Systematics is more than just a name game. Experts in this discipline document organisms and group them in a way that reflects their evolutionary relationships. Garden systematists use a variety of techniques to learn the basic characteristics of a plant under study, from simple measurements of plant parts and shapes, to more sophisticated microscopic, biochemical, and molecular approaches. Then, they can assign the plant to a particular taxonomic group based on its similarities to others. 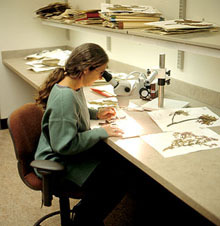 Mary Merello, project coordinator for Costa Rica, examines plant specimens in the herbarium. As a botanical generalist, Ronald Liesner is an expert at sorting plants into families and making preliminary identification to facilitate further study.